Into every writer’s life must come mountain peaks and deep valleys. And plateaus. These offer experiences that, depending on the writer’s perception and maturity, lay the foundation for the next article, the next story, the next post. As much as the deeper vales produce in me a greater capacity for growth and understanding, I have to admit I like it best on the mountain tops. It may just be a peak, and I may have to descend (or free fall) the next day, but for the moment, it is all I can do to keep from bursting with exultation. Consider the one I am on right now. A book I worked on last year is going to be launched in September. And while I always found it thrilling to have an article or devotional I wrote be published in the States, there’s a different kind of joy at the thought of having my work published in my home country. Not better, just more poignant. Several days ago, hubby and I were listening to Dr. David Jeremiah on the radio. In his sermon, he told a story about the late J. Vernon McGee, and how the good preacher will continue to share Christ with many through his recorded sermons. He may have gone on to his eternal home, but he’s still making a difference here on earth. Dr. Jeremiah then shared how he hoped to do the same thing. And as I sat listening to him, I realized I wanted the same thing as well. Here’s the reason for the joy I now have: that somehow, somewhere, something I wrote will lead someone to look up and hear His voice–that the Holy Spirit will see it fit to use my borrowed words to bring comfort, joy and challenge to someone I may or may not know. Mayhap, I get to hear about it. Most likely not. But what does it matter, as long as God is glorified? 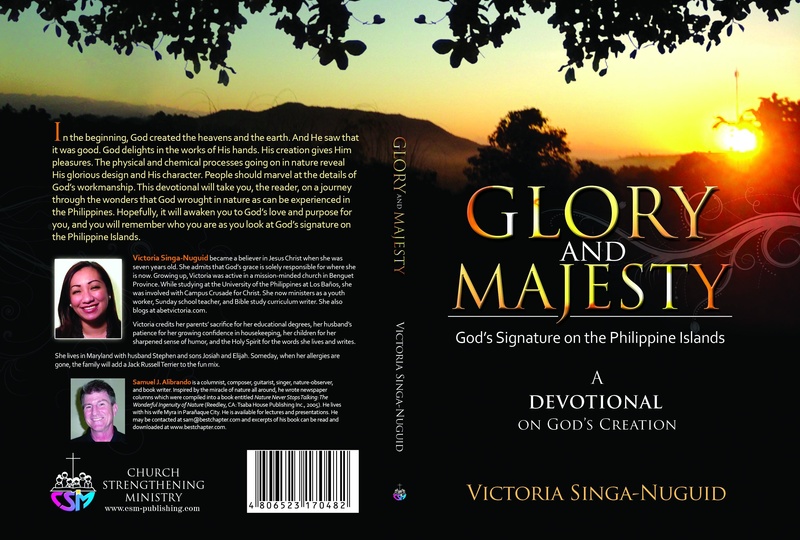 And so, as God wills it, here’s my contribution to your library: Glory and Majesty: God’s Signature on the Philippine Islands. May it cause you to ask the more difficult questions, for I know firsthand that the Father is never afraid of our questions. He will, instead, use them to bring us to a closer walk with Him. ***The book launch will take place at the Manila International Book Fair on September 14 – 18 at the SMX Convention Center, Mall of Asia, Pasay City. I hope to see you there! I hope this book will be helpful tool to give glory to God our almighty. Congrats for your book launching. God bless. i’m so happy to witness how great God is in the lives of those who truly seek Him! May God be honored though you indeed! Both so proud and oh so envious of your accomplishment, Ate Abet!!! So glad this is finally happening for you!!! erratum: that God will use you some more as an avenue for others to see how wonderful He truly is. Thank you, everyone. I really appreciate all the support and encouragement. The way I feel right now, I just have to say, nothing beats living out your life in His service. No matter how many times I fumble, His grace somehow finds me and helps me stand. hi abet, So blessed to meet you today..so this is what made you busy ,Writing… and its more fulfilling because you are writing for Gods Glory..God bless you pretty one.WE support you in prayer..AM PROUD OF YOU!